As Mary Wilson died a few days ago on June 6 2018, this week’s object commemorates her family’s contribution to OU by considering the Wilson Building on the Walton Hall campus, seen on this video. It is here that Harold’s role is outlined. He had a vision of a university of the air and, as Prime Minister, he had the clout, to ensure that his idea, voiced in 1963, was developed by Jennie Lee and others and implemented by 1969. Mary and Harold married in 1940 and had two sons. One son, Giles, became a teacher and later a train driver. The other, Robin (born in 1943) taught at the OU. After a difficult start, as the interview panel was anxious not to be seen to favour the son of a Prime Minister, Robin was appointed. His significant academic qualifications and huge enthusiasm were soon demonstrated. He became a Professor, the Head of the Mathematics Department and a Dean of his Faculty. 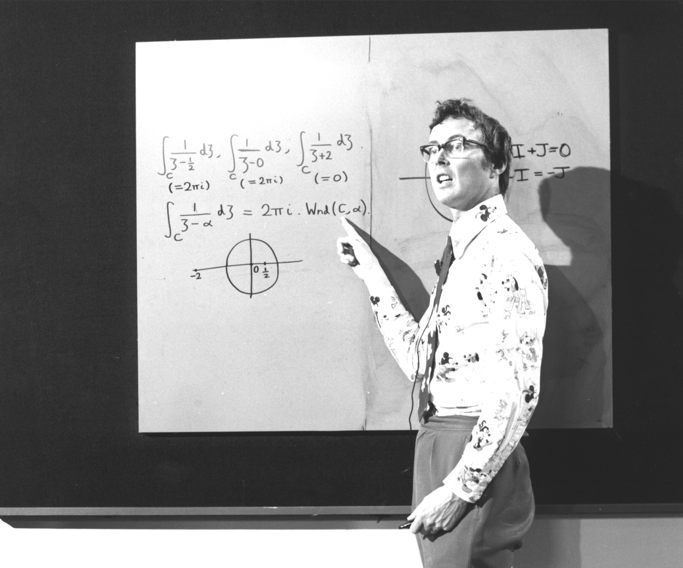 Despite the supercilious portrayal of an OU mathematics don called Robin by Cambridge graduate Hugh Laurie in A Bit of Fry and Laurie, Robin Wilson’s innovative and supportive teaching of mathematics (he is pictured above) has been fondly remembered by many students. Numerous OU learners have memories of the frightening and incomprehensible world of school maths dispelled by Robin’s engaging ability to teach. The Wilsons were able to see beyond party politics. Robin graciously recognised the role of Margaret Thatcher in the development of the OU, calling her its ‘stepmother’. Her role at the OU has been assessed elsewhere. Mary Wilson attended Thatcher’s funeral. She was also present at one of Harold’s last public engagement’s, the opening of the OU building named in his honour. Wilson’s press secretary called the OU Wilson’s ‘monument’. The description is an apt one if the reference is to the words written for Christopher Wren, lector si monumentum requiris circumspice (‘Reader, if you seek his monument – look around you’). The story of the Wilsons is reminder that for many families once one person becomes involved with the OU other family members become entangled. Couples married after meeting at residential schools, there are many staff who have spouses, and offspring working for the OU and many students swear that it was the support of family members which got them through their degrees. If you visit the OU’s Milton Keynes campus, when you next pass the Wilson building, give it a second glance and maybe give a nod to Harold. This entry was posted on Monday, June 11th, 2018 at 12:01 am by Daniel Weinbren	and is filed under 50 objects, People, Walton Hall campus, women. You can follow any responses to this entry through the RSS 2.0 feed. You can leave a response, or trackback from your own site.